The future missions to Mars get a massive lead about where to send the rovers to search for signs of life. Mars is the most popular candidate when it comes to finding an alternative habitat for humanity. The idea of making humans a multi-planetary species has grown widely in the recent past and different space agencies of the world are investing some serious time and money to accomplish this extraordinary feat. Elon Musk, the CEO of SpaceX, has been one of the most enthusiastic individuals in this regard who wants to send humans to the red planet in 2024. Having said that, a recent paper suggests that under specific conditions, the water on Mars may have more Oxygen than previously believed. The study also indicated that the levels could get high enough to support aerobic respiration on Mars. This is a complete opposite of what we have known so far about the potential of Mars for hosting habitable environments. Tracing liquid water on Mars is one of the primary goals of the Mars Program of NASA. 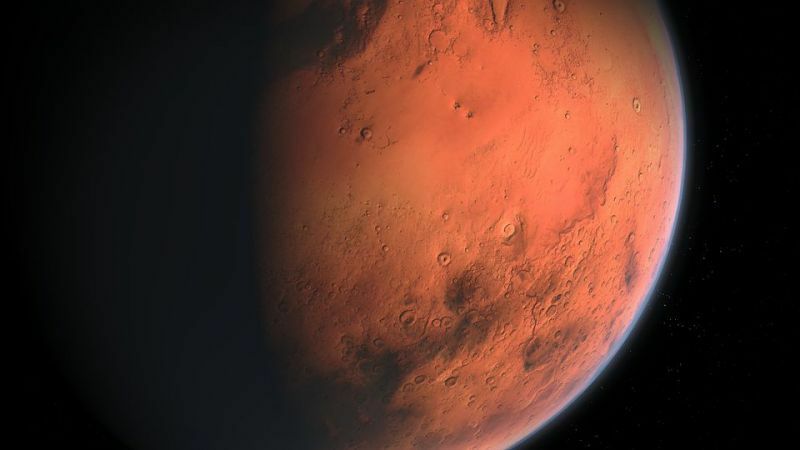 Recently, the data from a European spacecraft pointed out that liquid water could be present beneath a layer of ice at the South Pole of the red planet. Other than that, the discovery of perchlorate salts at various locations on the planet leads to a theory that liquid water could exist in form of salty subsurface pools. The fact that salts lower the freezing point of the water provides the basis for this particular theory as the temperatures on Mars are quite low. This hypothesis is the thing that urged Stamenković and his team to the latest discovery. Generally, Oxygen from the atmosphere diffuses into the water to maintain an equilibrium between the air and the water. Assuming that the salty water is close enough to the Martian surface, it may absorb Oxygen from the thin atmosphere of the planet. In order to estimate the quantity of Oxygen that can be absorbed, the researching team created a chemical model which described the dissolving of Oxygen in salty water at temperatures lower than the freezing point of water. Additionally, they analyzed the global climate of Mars and observed how it changed over the past 20 million years. The collective study of climate models and the solubility clarified which regions of the red planet are most capable of sustaining high Oxygen solubilities, both today and historically. The research showed that the low-altitude regions, where the atmosphere is thickest, has an unexpectedly high amount of Oxygen that could be absorbed by the water. Similarly, the amount of Oxygen in areas with low-enough temperatures was easily above the threshold needed for aerobic respiration in the oceans of the Earth. Despite the fact that the tilt of Mars’s axis changed over the past 20 million years, the highest oxygen solubilities have occurred within the last 5 million years.